This is a cost-effective yet premium living space for individuals, perfectly made for happy family life. Sangati offers comfortable home, with a small township in its own. It has every modern feature, beyond what you’re thinking like a shopping mall with multiplex, a school, a hospital, a leisure club, an office block and a central park. A 12 storeyed urban Skyscraper in the heart of Shristinagar Asansol planned by Singapore based modeller is a perfect living apartment for you. This is a well planned and structured apartment offering 2BHK and 3BHK flats. Rooms are well shaped and built with adequate breathing space. Apart from a safe and anchored life, Shristinagar provides to you a pleasurable life and a comfortable neighborly environment. 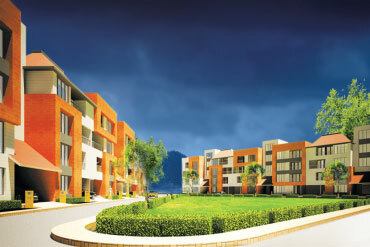 Shristinagar Asansol offers unique opportunity to offer duplex complex as well. All the three types of bungalows that it offers, it ensures to offer a sense of privacy to its people. This Asansol township is ideal for anyone looking for an independent housing with apartments like security and maintenance service. The first high-rise of the city, offers G+ 9 constructions with 2BHK or 3BHK flats in Asansol. A comprehensive place which brings to you all your necessary amenities to enjoy the urban lifestyle within the greenery, residents surely will enjoy the breathtaking paranomic view of the city. This all and much more that Bengal Shristi aspires to bring for the people of Asansol. Feel like the place is your city in the residential projects of Bengal Shristi because there is no place like home.